Vicki Rulli and Tom Heaphey use pieces of sustainably harvested birch to print this uplifting photograph. 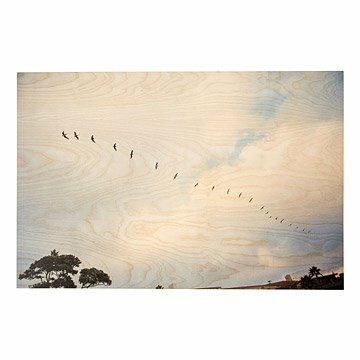 Bring an ethereal touch to your home with this beautiful artwork, featuring a flock of birds crossing a cloud-filled sky. Blending the crisp colors of digital photography with a rustic wood canvas, Vicki Rulli and Tom Heaphey create a beautiful landscape with an unexpected twist. Each piece of sustainably harvested birch plywood is selected for its unique grain and texture. After being cut and hand-sanded, a UV-cured ink is used to print the image, while still allowing the wood's natural character to show through. Handmade in Ohio. Due to the nature of the materials, some variance is to be expected. This is for our boss who created an amazing team for patient experience. She has built is into a formation with her by our sides. Such an amazing landscape! I love it a lot! Unfortunately, I haven't seen the art myself. But everyone that was on the receiving end of the gift loves it! Mission accomplished. This is perfect for a bedroom wall. It gives a pleasant atmosphere to the room.